The last day of 2016 was quite eventful, long and hectic. 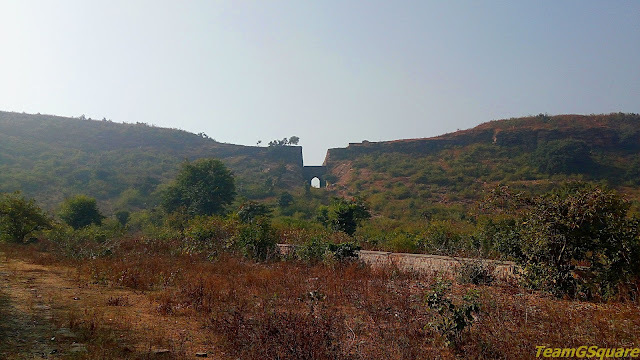 A few places we visited around Bhopal and Vidisha were that of Sanchi, Udaygiri, Gyaraspur, Badoh - Pathari and Udaipur. Hereon, our next destination was Chanderi and as we were done for that day, we had to drive to Chanderi and halt for the night. Chanderi will always remain close to our hearts for various reasons which will become evident as the story progresses. After a light evening snack at Ganj Basoda, we were on our way to Chanderi which was about 130 km from here. Our quiet and uneventful ride was interrupted by a fox crossing the road! What a sight it was! Sadly, it didn't stay long and gave us no chance of capturing it on camera. We continued with our journey hoping to sight more wild life and lo! we spotted a Jackal couple enjoying their private moments on the road only to be disturbed by us. We stopped our vehicle in an effort to let them be and tried not to disturb them. This great moment lasted for a few minutes with the jackals vanishing into thick woods. We reached Chanderi and found a room to settle down for that night. However, we had to drive ahead to Hotel Tana Bana maintained by MPSTDC for dinner. The hotel was booked priorly and decked up for the new year celebrations. We had our buffet dinner which was a part of the new year feast and rested for the night. Our next morning began with a hunt for a place to have break fast and as we finalised on one, we had to reverse our vehicle to stop by that place. While doing so, a biker collided with our vehicle's rear end. Though not much damage occurred, the biker began to exaggerate the situation. Luckily, since it was not our mistake, many locals gathered around and began to assess the situation. They told the biker to check for any physical injuries or damage to the two wheeler and when they realised it was nothing major, they adviced us to leave the place immediately. The biker had no choice but to leave silently. We proceeded further in search of another place for break fast and thought that we were lucky to have overcome this situation rather easily as such instances are known to be an easy mode of exhorting money, with the victims falling prey to it. Chanderi is a small town located in Ashoknagar district of Madhya Pradesh and famous for its sarees. The Chanderi saree also finds its mention in the great epic of Mahabharata, thus proving its antiqueness. There are many weaving centers across Chanderi today producing these sarees. The Bundela Rajputs built the existing Chanderi city in 11th century AD. 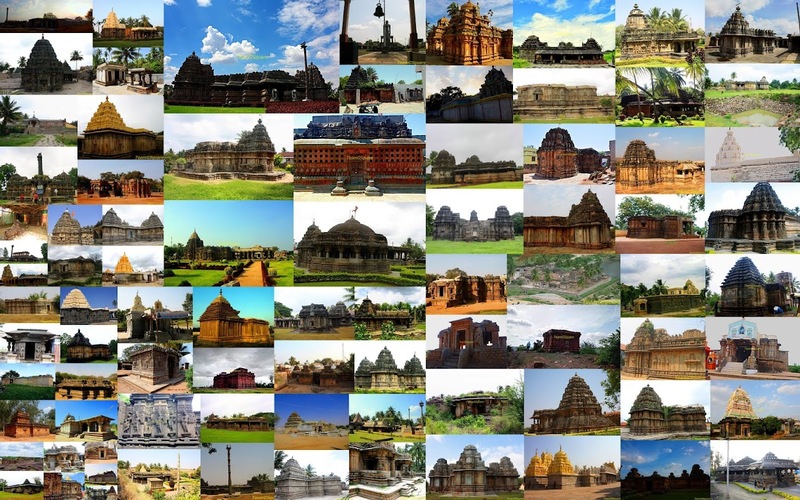 There are various temples, Jain temples, Baolis and other structures here. Later in 13th century AD, the Malwa Sultans captured Chanderi from the Rajputs and refined and rebuilt the city, its forts and palaces. It changed hands many times between the Mughals, the Rajputs and the Marathas before finally falling into the hands of the British after which the Sindhias ruled till Indian Independence. Badal Mahal Darwaza: This beautiful gateway to the hill fort was built in 1460 by the Sultans of Malwa as a memorial to commemorate their victory over the Bundela Rajputs. The gateway consists of an arched entrance above which is another arch comprising of intricately carved Jali of geometrical designs and two gradually tapering circular towers. This place is very serene, thanks to the well maintained gardens surrounding it. 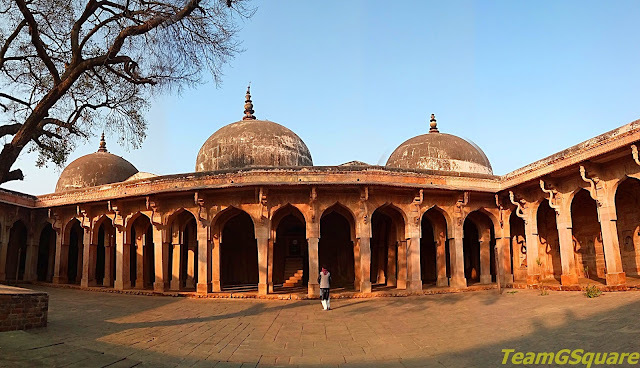 Jama Masjid: This huge Friday mosque built around 15th Century has a spacious open court with a sanctuary in its west and arched cloisters in the north and south, with the eastern portion being damaged. The mosque is not associated with any minarets, making the structute quite unique. The entrance to the mosque has a few delicate carvings. 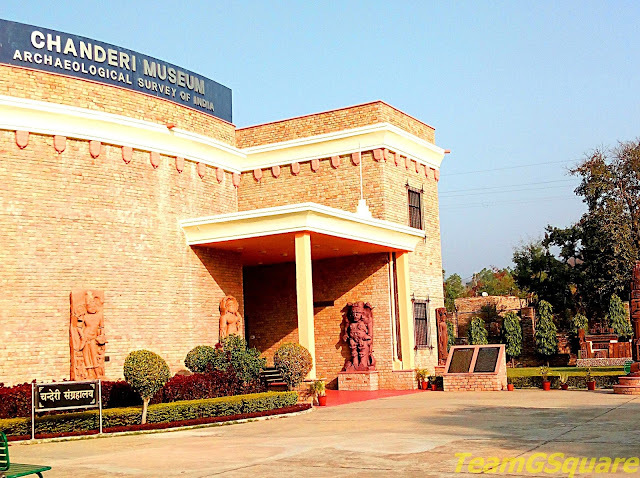 ASI Museum: The museum is a big and modern building, housing various collections found during excavations in and around Chanderi. Photography is prohibited inside the Museum. Koshak Mahal: This beautiful monument was built during the 15th century AD by the Sultans of Malwa. Only 3 storeys of this palace survive today, which originally was a 7 storey palace. Built in Afghani style in the shape of the Greek Plus, it has four symmetrical divisions. The grandness of this place is limited to our imagination. The balconies in all directions adds to its grandeur. 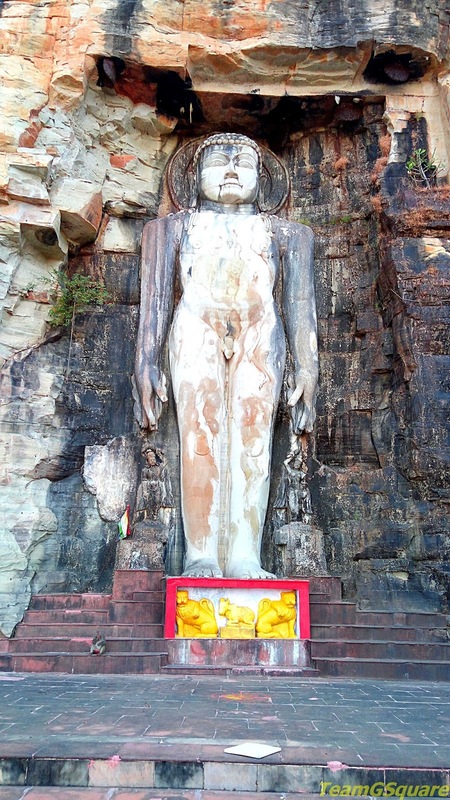 Jain Temple, Khandaragiri: This place has a beautiful 45 feet tall rock cut murti of the first Jain Tirthankara Rishabhnath, popularly known as Adinath. There are many cave temples in the surroundings. Kati Gati: This is the southern gateway to the city of Chanderi built by cutting solid rock, thus the name Kati Gati. There are a few inscriptions here that tell us about the construction of this gateway by the order of Jiman Khan in 1490 AD. Chakla Baoli: It is believed that around 1200 stepped wells were built in Chanderi by the Chandela Rajputs and the Sultans of Malwa. Chakla Baoli is one such, built during 15th century by the Sultans and later additions to these were the two Chhatris built by the Rajputs in end of 17th century. Purani Adalat (Old court): The Haveli of Bundela kings built in 17th century was later converted into a temple of justice, which was under use till independence. Madrasa (School): An old Madrasa here was built during 15th century by the Sultans to impart Islamic education to children. 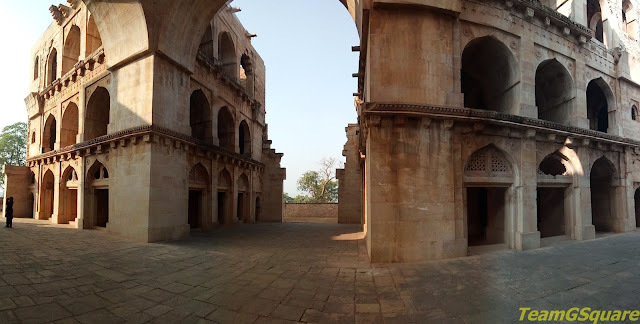 Chanderi Fort: The major tourist attraction here is the Chanderi fort built by Kirttipala, a Pratihara king in 11th century, due to which this place gets the name Kirttidurga. There are two tombs here, one dedicated to the renowned musician Baiju Bhawara who probably was the only singer to defeat Tansen, one of the greatest musicians in Akbar's court and the second is the Johar tomb dedicated to all the Rajput ladies who scarified their lives rather than being captured by Babur's Army. Other places of Interest: Jageshwari Temple, Parameshwar Lake, Shahzadi Ka Rauza, Shahi Madrasa, Singhpur Palace, Battisi Baoli, and many more. Distance from nearby town: 36 km from Lalitpur, 60 km from Ashoknagar. Accommodation: We stayed at Hotel Shri Kunj which was quite a decent place for stay having various option for all types of travelers. This apart, there is a Hotel Tana Bana maintained by MPSTDC which is also an equally good option and a PWD rest house. Where to eat: Hotel Tana Bana is the only decent option along with various other road side eateries. 1. The Guide to the Architecture of the Indian subcontinent by Takeo Kamiya. 2. RBS Visitors Guide India - Madhya Pradesh. Chanderi fort is a must visit monument . Great write up with pictures. Loved the post and pics. Amazing place. The balconies of Koshak Mahal make the building look unique. The Kati Gati also stands out. It was nice knowing about these places and the attractions there. Thanks for showing us Chanderi! I love the temple, great photos. Amazing shots of your travel! Some buildings are just amazing to see!